What is “get copies” feature in AMSSE and why need it? In Auto Mail Sender™ Standard Edition (AMSSE), “get copies” means that you can get a copy for each outgoing email. Since our email sending software is used to send email automatically, so, for monitoring (delivery status) and reviewing (real effect) reasons, you may want to get a copy for each sending. It’s a friendly and useful feature in our email automation software. 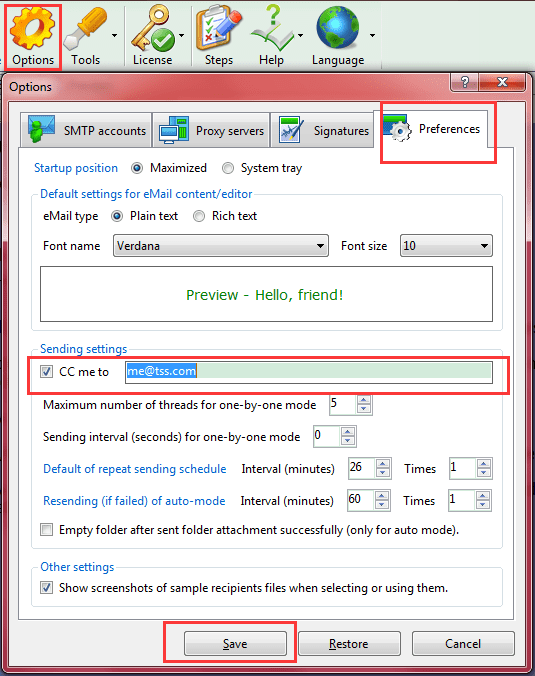 This feature is designed as a setting in our mail auto sending program, the benefit are outstanding: you do not need to always append your own email address to the [CC] field for every email, just need to set it once. It will work. Even if you do not mind the uninteresting manual work, but you may forget it, so designed it as an option is best choice. How to enjoy the “get copies” feature in our email automation software? Screenshot: Getting copies feature of our mail auto sending software. Once set it OK, you will get a copy of every outgoing email that sent by our email sending software automatically. Note: we recommend you do not use the email address of your default email account as [CC me to] address because a few email servers/providers reject sending message to self. But if you sure that your default email server/provide has not this limitation, set it as any valid email address as you wish. Download Our eMail Automation Software for Windows® Now!